Extremadura: Province of Badajoz (North), Province of Badajoz (South), Province of Cáceres (North), Province of Cáceres (South). The Canary Islands are also available from CNIG for: El Hierro, Fuerteventura, Gran Canaria (priced individually). See Discovery Walking Guides below for other Canary Islands at detailed scales. Additionally maps at both scales are available via the Viewranger Webshop. Tenerife (whole Island) (1:25K & 1:35K) topographic map covering all of Tenerife. Created by combining CNIG maps & DWG maps. The DWG areas are marked with the walking routes of Walk! Tenerife. Mallorca (North & Mountains) (1:40K) topographic map covering the North and Mountains of Mallorca. Marked trails include: walking routes of Walk! Mallorca (North (West). 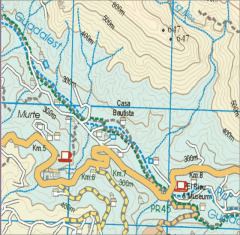 Costa Blanca Mountains (1:40K) -topographic map covering the walking areas in the Costa Blanca Mountains, Alicante province. 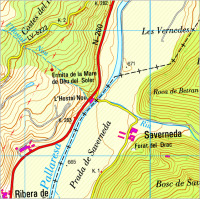 Sierra de Aracena (1:40K) -topographic map covering this walking area in western part of Andalucía, close to the Portuguese border. 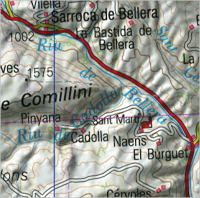 Axarquia (1:40K) -topographic map covering this popular walking area to the east of Malaga in Andalucía.